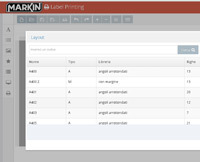 Label Printing is the software for creating and printing your own labels. Thanks to the new software, you will be able to create and print your labels with the correct layout, without wasting time and paper. 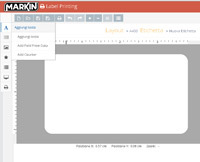 With just a couple of mouse clicks you will print your labels exactly the way you want them. 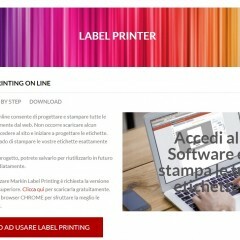 It is really easy to print you personalized labels, in office or at home, with Label Printing Software. 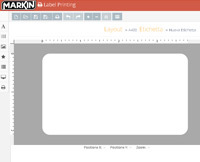 With Label Printing Software is really easy to create and print your personalized labels! 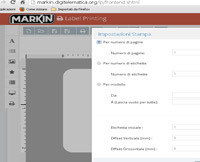 Click on the button and open Label Printing, if you’re not a registered user, you can sign in very quickly! Select the label type from the LIBRARY drop-down menu, choosing the colour (white, transparent, coloured, silver, gold), the glue type (permanent, removable), and the material (paper, polyester). You will find the list of all available sizes in the LABELS window. Scroll to choose the size, and check the PREVIEW window to find the desired one. You will find the selected label on the upper left corner. Choose the label quantity for each paper sheet and the number of sheets to print. Select from the drop-down menu Open> text, Image, Barcode, geometric shape…..
We will see now how to insert a text, to create adhesive labels for shops, addresses, invitations and announcements, discounts and promotions, communications. You can enter the labels quantity for each sheet in the LABELS field. You can enter the sheets quantity in the SHEETS field. You must be registered to download the software.